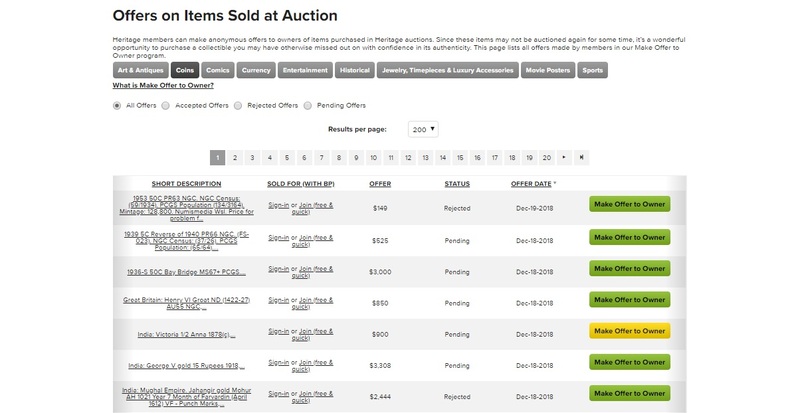 Dallas, Texas (December 18, 2018) — Heritage Auctions’ Make Offer to Owner (MOtO) program, through which clients can make anonymous offers on lots previously sold at auction, has added an extremely useful new feature showing the amount and status of every resale offer ever made via the website of Heritage Auctions. Any Heritage member who sees a previously auctioned item of interest with a Make Offer to Owner button has the option of submitting an offer, after which the item’s owner can accept or decline the offer, or submit a counter-offer to the potential buyer. The new Make Offer to Owner Archive is sortable by category in addition to accepted, rejected, and pending status. The archive includes every MOtO offer made via Heritage Auctions’ website since the feature was introduced first in 2009, with the most recent offers appearing first. Heritage’s MOtO program has become increasingly popular with both sellers and buyers. Most members who have made a purchase through the program have bought, or at least made offers, again. Using the program offers clients an added measure of security and comfort about the authenticity of a lot that cannot be replicated through a secondary outside seller. The program has enjoyed tremendous growth, with combined sales in 2017 and 2018 — the program’s two most successful years — of more than $16 million. The MOtO program has been particularly popular among sports and comics collectors.